We’re all aware of VAT (Value Added Tax) as it’s applied to almost all goods and services in the UK, for both business to business and business to consumer markets; but what does it mean for you as a small business owner? With the recent changes to the VAT Flat Rate Scheme, the standard VAT method is becoming more attractive to contractors, consultants and small businesses. Simply put, on the standard scheme, businesses need to add up the VAT they have charged to their clients and deduct the VAT they have paid on goods and services purchased. The difference is then payable to HMRC. The standard VAT method involves manually reclaiming VAT on each eligible item you buy or sell and paying VAT at 20% from your invoices to HMRC. With the help of an online accounting system, the standard VAT method is easy and straightforward. A note on VAT in general: If the majority of your clients are consumers, or very small businesses rather than VAT registered businesses (e.g. the general public or small businesses that aren’t VAT registered), there may be price sensitivity issues. If this is the case, adding VAT may price you out of the market. If your actual or expected turnover exceeds £85,000 a year, VAT registration is mandatory, but you can register voluntarily if your turnover is less. Many small businesses do as it improves tax efficiency and can show greater financial stability to potential clients. Certain expenses don’t include VAT such as travel costs. However, if you travel a lot and stay in hotels, your hotel bill includes VAT and you may lose out so consider this when applying for VAT registration. When you become VAT registered, you need to provide VAT invoices to business clients. There are certain pieces of information that are required on a VAT invoice listed by HMRC here. Once registered you will need to keep records of all your sales and purchases (even if you cancel them or produce one by mistake). While reclaiming VAT on your expenses may sound like extra hassle, it’s very straight forward. All you need to do is ensure you choose the correct VAT category (for example ‘Accounting Expenses’) and rate on your expenses when you upload them as part of your usual record keeping. 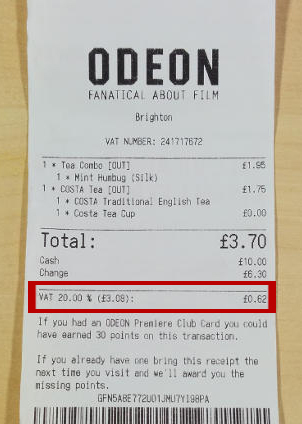 The VAT rate and amount can commonly be found on receipts, as seen in the examples below. 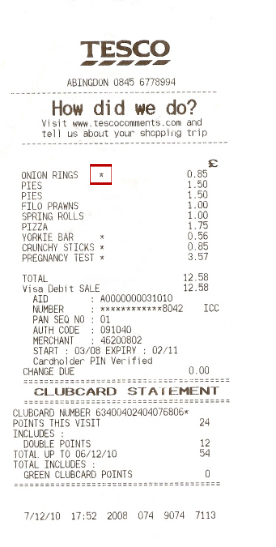 You may occasionally receive a simplified invoice such as the one below. 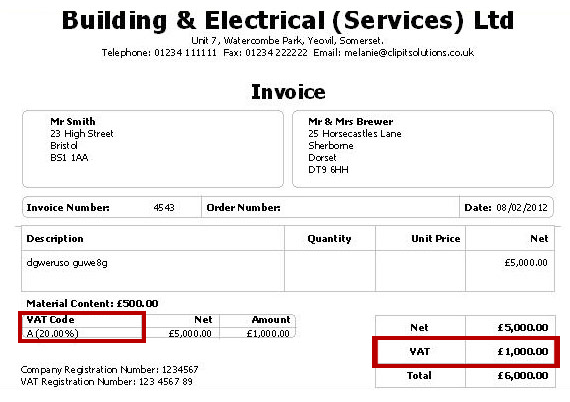 On these types of invoices, you’ll find any items subject to VAT are individually identified. Tesco for example use a *. Some supplies you are likely to use that incur VAT include accountancy fees, fuel, large hotel and restaurant chains, multistory car parking and most purchases from large UK suppliers. You can’t reclaim VAT using an invalid invoice, a pro-forma invoice, statement or delivery note. You can also reclaim VAT on your business mileage. This is done through your mileage log by selecting your vehicle’s engine type against a mileage entry. This applies to all car and motorcycle journeys made. Going forward, all new entries made will automatically have your vehicle’s engine type set. This will then be added to your next VAT return to claim back VAT using the HMRC Advisory fuel rates for that period. Don’t forget that with any VAT claim, you should have a corresponding receipt with enough VAT to cover the claim, this includes any fuel receipts. If you have a Hybrid car, then you need to select the other fuel aside from electricity that it does use. For example if you have a Hybrid car that also uses petrol you would select petrol as your fuel type and then the relevant engine size. VAT is only claimable on mileage for a car or motorbike that uses petrol, diesel or gas. You can not claim back VAT on fully electric vehicles. While some things are exempt from VAT, such as postage stamps, insurance and property transactions, most goods and services are standard rate. You should select this rate when Bookkeeping and recording your expenses unless the goods or services are classed as reduced or zero-rated. You can find information on VAT rates for different goods and services here. VAT returns are simple with inniAccounts as the software helps you charge VAT at the correct rate and calculates the correct amount of VAT for your VAT return. This way it keeps you in the picture and you will always know what your incoming VAT bill will be. At the end of each VAT period, when you generate your VAT return in the software you will receive a breakdown of all your transactions as well as the VAT rates and categories for that period. You will be able to check this information before you submit the VAT return. You can find more information on VAT registration, record keeping and processing VAT returns here.